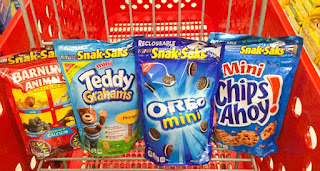 This week at Target you can score Nabisco Snak Saks for just 67¢! Use 50% Off Nabisco Snak Saks Cartwheel (x6/23) and use $0.75 Off Two Nabisco Cookie or Cracker Products from SmartSource 5/20 insert! Even better, then there is also $1 Nabisco Snak Saks Cash Back from Checkout 51 (x6/20, limit 5) available, but it cannot be combined with any other print or in-app coupon!